Are you trying to train your employees how to answer questions from customers with a variety of different needs? What you’re looking for may well be a slightly creepy robot bust with a swappable face. That “Employee Training Robot” is the work of Stockholm, Sweden-based startup Furhat Robotics. 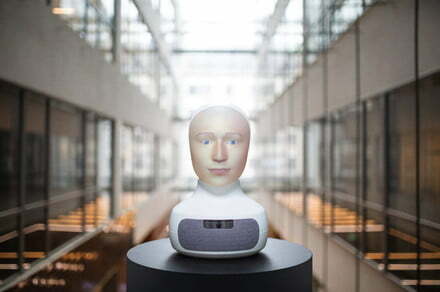 Boasting a wide-angle high-res camera, stereo speakers, and beamforming microphones, the technology aims to fill the niche of an interactive robot for workplace training environments. By projecting different faces onto its 3D-printed mask, Furhat’s robot can transform itself into a man, woman, child, or even an animal. It can do this while speaking, listening, maintaining eye contact, and even appearing to show emotions to the person it is communicating with. Unusual? Most definitely. Potentially useful? That’s the hope. The idea of training an employee by getting them to speak to a robot head sounds unorthodox. But, really, it could turn out to be pretty helpful. In a job where face-to-face interaction with the general public is a regular occurrence, a robot like Furhat’s could help people simulate difficult conversations before possibly having to have them for real. Physicians already use robots to train for medical procedures, members of the military use simulations to get ready for warzone scenarios … why not also use robots for customer service training? The Furhat robot is available and ready to be deployed in the real world. Its cost depends on the job that it is required for.